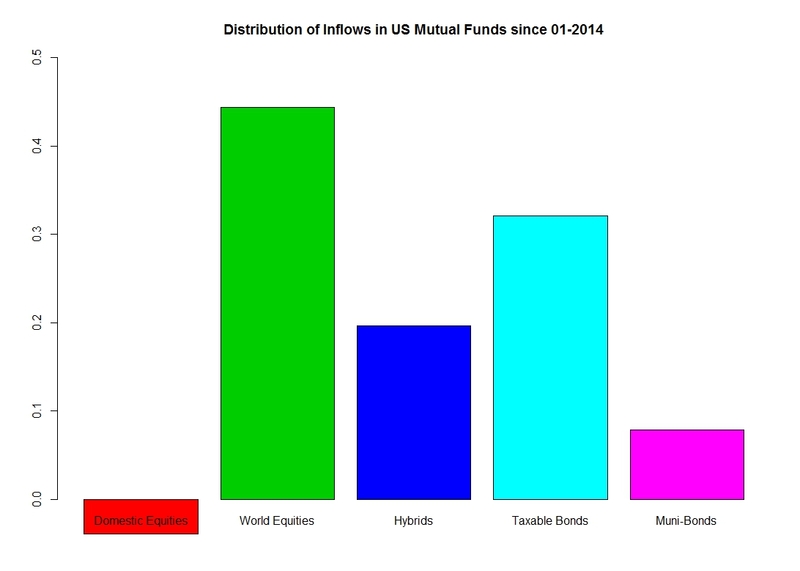 As it has been a while since I have posted something and my broken arm is no longer a valid excuse , I thought I would provide an update on trends in US mutual funds flows. To my surprise, bearing in mind the current geopolitical risks, there has not been much change over the last few weeks. US investors have held onto their preference for international equities whilst staying shy from the US stock markets. Also the trend of inflow into bonds remained despite growing expectation of the Fed becoming more hawkish down the line. 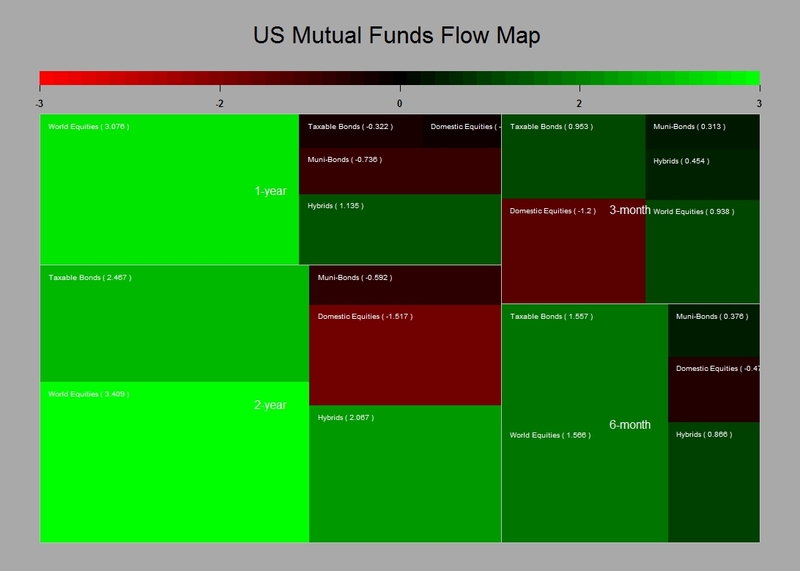 The map below shows the T-stats of the inflow/outflows across different time periods. Clearly the dovish tone adopted by the Fed has helped both the trend in equities and also bonds. The question is how long can this last ? Clearly the strengthening observed in the US job market demonstrates that significant growth has rooted. Down the line this will create an issue for the fed, as managing rate expectations whilst turning away from a dovish stance may prove challenging. To me the most interesting point of all is how US investors voted with their money. 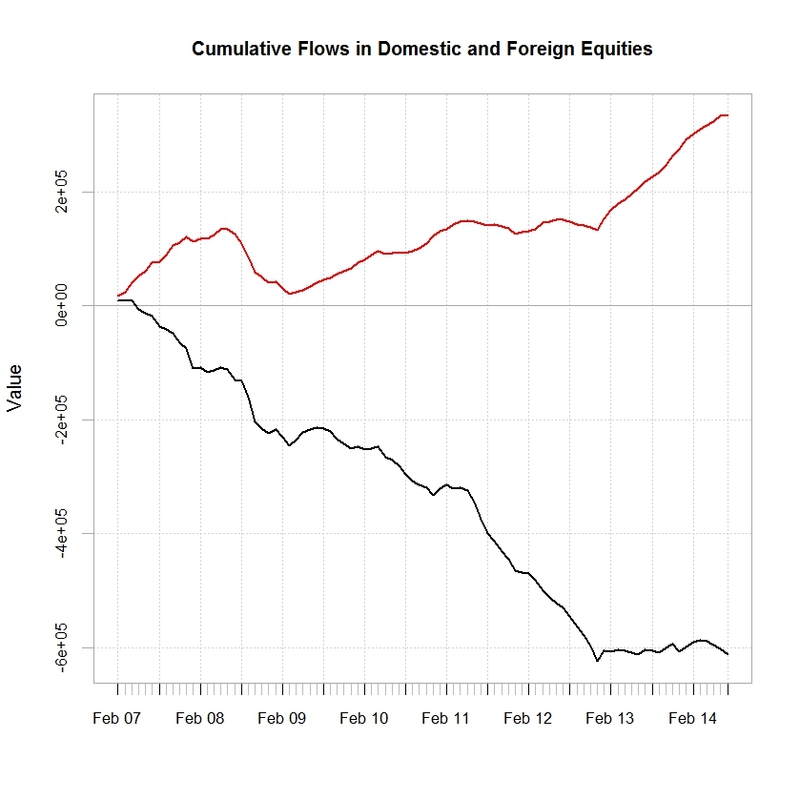 As can bee seen from the below charts they have stayed well away from US equities whilst investing in Foreign equities. In fact out of the US$ 133 bn invested in US mutual funds 44 % (US$ 59 bn) went into foreign equities so far this year, whilst US$ 5bn came out from US Stocks funds. As said in my previous posts I believe that what we are seeing could be a good explanatory variable as of why the dollar has been so weak and particularly against the EURO despite the monetary expectation in Europe and the US. Bearing in mind the current market positioning and central bank flows it may well be that the EURUSD is currently undervalued…. Posted in Fed Policy, FX, Stock Market on July 11, 2014 by Pierre.